A panel of experts from the council that accredits forensic laboratories has sustained allegations that the Broward County Sheriff's DNA lab has been using improper methods to analyze certain DNA evidence. The lab has been using inappropriate practices to calculate the likelihood that one person - usually a criminal suspect - left his DNA on evidence that has DNA from more than one person, the accrediting council board found. The sheriff's office appealed that finding by the American Society of Crime Laboratory Directors/Laboratory Accreditation Board, but last week was informed a three-expert panel rejected the sheriff's appeal. 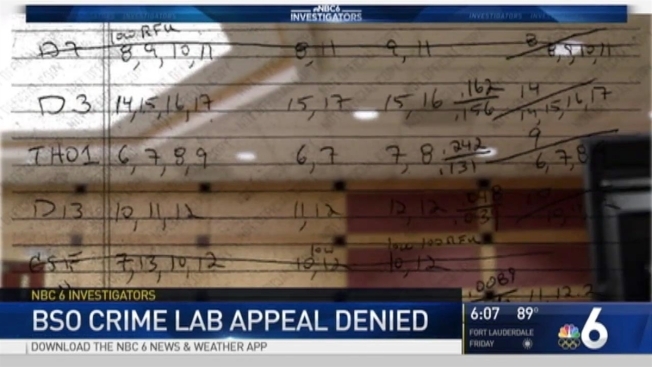 Broward Sheriff's Captain Fernando Gajate told NBC 6 Investigators he was contacted by the accrediting agency last Friday and given a choice: stop producing conclusions about the statistical significance of DNA found in mixed DNA samples, or face suspension of the DNA lab's accreditation. Without accreditation, the lab's DNA results would not be recognized as valid by the national DNA database run by the Federal Bureau of Investigation. And defense attorneys would likely challenge the competence of DNA evidence coming from a lab that lost its accreditation. So, Gajate said, the lab agreed to subcontract the statistical analysis portion of its complex DNA mixture work to an approved laboratory, while launching a 90-day corrective action plan that will include obtaining new software. Gajate stressed the lab's work extracting and identifying DNA is not being questioned; the sustained allegations involve how it uses that DNA to generate statistics estimating the likelihood one person can be included as a contributor to a mixture of DNA from more than one person. If the board is not satisfied with the lab's corrections, and the lab's further appeals are also denied, it could still revoke or suspend the lab's accreditation. Meanwhile the state attorney's office Wednesday began informing defense attorneys that the lab has lost its appeal of the two now-sustained allegations: considering the DNA profiles of suspects before determining which portions of DNA from evidence would be used for comparison; and identifying evidence of DNA that is so minuscule, it should be disregarded. The state attorney's office said it is still discussing whether and, if necessary, how to inform defendants who may have been convicted based on statistical DNA testimony now found lacking. Defense attorney Monique Brochu, who began questioning the competence of the lab and its consultants last year, said the sustained violations support her argument that DNA evidence against her client, accused murderer Javon Gibson, should be thrown out. "It’s not supposed to work that way," Brochu said. "I think these numbers were being bolstered by statistical experts to try to make them look better." Gajate said the lab would subcontract with an approved lab to redo statistical calculations of DNA evidence, if so ordered by a court.